About 2 weeks ago, the beta version of Metatrader 5 was sent to a selected group of developers from the MQL4 community. One of them has posted a small review of the upcoming trading platform Below are some of his findings. This is not Photoshop - it's MQL5. This innovation greatly save memory and time simultaneously. - OnChartEvent () - event handling of the mouse and keyboard on the chart. So now we can get control not only on the arrival of tick, as before, but also on a timer, that allows you to write full-fledged program operated in real time. This feature allows us to create more featured systems. The function OnTrade () is called when any of the trade events is happening: placing orders, StopLoss or TakeProfit, changing levels of stoploss or takeprofit, editing or deleting a pending order. So the monitoring of trading operations events is now much easier than before. There is no need for the checking of the orders on ticks or bars, what previously had to be done in MQL4. So the speed is now much better, particularly in optimization. Graphic objects allow you to create information panels. New graphics, buttons, input fields. The control of graphics is now on a fantastic level, you can even insert pictures from files - custom designs for lovers of non-standard design. 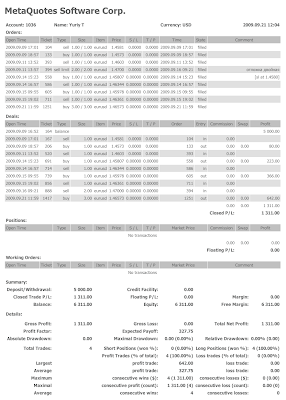 This is not Photoshop, it is possible with MQL5 and MetaTrader 5. There are new opportunities, you can create your own buttons and their input fields, such as adding an interface button that will close all open orders. Or quick buy or Sell in a single click, with pre-fielded parameters of stop loss and take profit. If we talk about the terminal itself, the first you will notice is the big number of timeframes. But the abundance of minute timeframe, probably will please those who have so long dreamed about it. Dreamers of non-standard timeframes are one step away from a custom timeframe, which, however, can be considered as unnecessary. Method of data storage is now 1 minute, so there are no more problems with the synchronization of different timeframes - this is a very important technological solution. Another improvement: Logs can now be cleared. 1) The No Hedging / FIFO rule the NFA has created and that MT5 explicitly enforces is a truly pathetic. 2) The change in MQL5 from MQL4 and the incompatibility of the 2 is doubly pathetic. Let me say, I agree with both points and here are some reasons why they have gone this direction. Easy to draw S&R lines! Would be great if the 2hour time frame is included. Tx.